Home Fires tells the fascinating story of how changes in home heating over the nineteenth century spurred the growth of networks that helped remake American society. 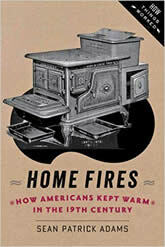 Sean Patrick Adams reconstructs the ways in which the “industrial hearth” appeared in American cities, the methods that entrepreneurs in home heating markets used to convince consumers that their product designs and fuel choices were superior, and how elite, middle-class, and poor Americans responded to these overtures. Adams depicts the problem of dwindling supplies of firewood and the search for alternatives; the hazards of cutting, digging, and drilling in the name of home heating; the trouble and expense of moving materials from place to place; the rise of steam power; the growth of an industrial economy; and questions of economic efficiency, at both the individual household and the regional level. Home Fires makes it clear that debates over energy sources, energy policy, and company profit margins have been around a long time. The challenge of staying warm in the industrializing North becomes a window into the complex world of energy transitions, economic change, and emerging consumerism. Readers will understand the struggles of urban families as they sought to adapt to the ever-changing nineteenth-century industrial landscape. This perspective allows a unique view of the development of an industrial society not just from the ground up but from the hearth up.